A music video celebrating the work of our fantastic WaveCrest Cafe team and the students and staff that we serve. 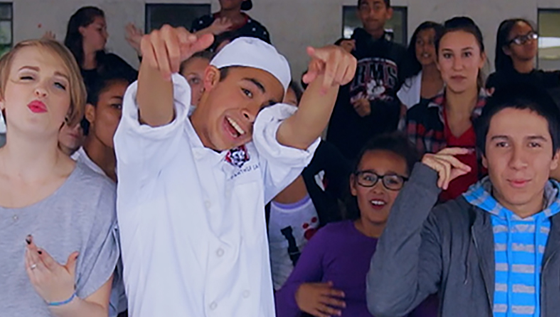 The two male rappers are VUSD students, and all of the choreography was done by students from across the district. Every parent knows the feeling of going to prepare a lunch for their child and realizing that the fridge and cupboard don’t have what you expected. This video takes a lighthearted look at that phenomena and assures our VUSD parents that WaveCrest Cafe has you covered. With lots of delicious and healthy options for breakfast and lunch, rest assured that we’ve got you taken care of. And we handle the clean up! One of the many ways we engage students in conversations about nutrition is by inviting them to try a variety of foods. Sometimes our items are new to them, sometimes they are foods that they know about but haven't tried. Every time we do this, new favorites are discovered, and lots of fun is had. Here's a peek at our Halloween 2018 edition from Bobier Elementary School. What does it take to prepare and serve over 20,000 fresh, healthy and delicious meals each day? Take a look at this video to see how our fantastic team takes such great care of the students in our cafeterias each and every day. A new student with a mythological reputation for starting food fights arrives at school and spurs whispered speculation about whether or not she’ll strike again. Of course, with the food that WaveCrest Cafe serves, why would that be an issue? Another fun celebration of the work of our team to change the face of school food. Check out this video of the beaumont bears sharing these great tips on how to use the salad bar. Don't forget your utensils and salad bar etiquette.